How does the world's most powerful software empire relate to virtual terrain? "When we launched TerraServer in June 1998, we had SPIN-2 imagery coverage of Europe, Asia, and other non-US locations. Our lease on the SPIN-2 imagery was for eighteen months through Aerial Images of Raleigh NC. At the end of eighteen months (January 2000), Aerial Images decided to host their own web site at terraserver.com. Since January 2000, TerraServer-USA (formally terraserver.microsoft.com) has hosted only USGS imagery of locations in the United States." The commercial branch offers only limited resolution, or full resolution at subscription cost, but the MS research version is a complete free, full-resolution WMS for both USGS DOQ and DRG, even including some color DOQs. very limited - can't resize window, can't display any of the same information as their primary map view, etc. 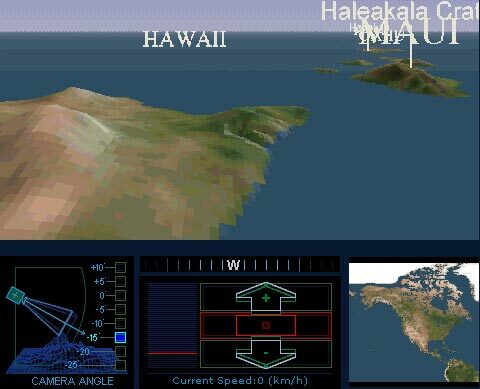 still has the "Virtual Flights" feature, which is, incredibly, apparently unchanged since 1999's Virtual Globe product! In December 2005, Microsoft bought GeoTango GlobeView, a reasonably sophisticated virtual terrain application. As of 2006, it remains to be seen whether they will try to advance and promote this product to compete with Google Earth. Microsoft's newer 3D terrain visualization software; created around 2005 via acquisition of GeoTango, then in 2009 given the bizarre and whimsical name "Bing Maps 3D"
Only runs as an OCX inside Internet Explorer (not standalone, no other platforms or browsers). Content is static. No way to display your own data or turn features on/off as there is with Google Earth.